With the economy at a standstill, your spirits 'portfolio' need not be. Invest in the best spirits without breaking the bank by concentrating on a few high quality classic liquors and specialties to stock your cabinet this season. And remember: serve less, savour more. Number one on your whiskey wish list has to be Connemara Cask Strength Peated Single Malt Irish Whiskey at 57.9% volume cask strength. This extraordinary handcrafted whiskey is surprisingly smooth for such a high volume and peaty flavour-no catch in the throat. Try it neat first to taste the complexity but add water to a level that suits your palate. "To experience whiskey in its most natural form, it can be tasted at the natural strength it comes out of the cask hence the high alcohol strength. 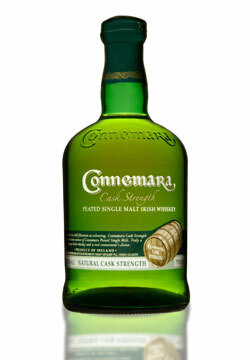 Connemara Cask Strength offers a unique opportunity to enjoy Connemara in its unaltered state. Bottled at 57.9%, it still retains an astonishing smoothness yet the character of the malt and peat is more pronounced creating an intense explosion of flavour across the palate. Undiluted with no chill filtration or colouring, Connemara Cask Strength captures the true essence of Connemara Peated Single Malt," explains Jack Teeling, Managing Director of Cooley's multi-award winning Distillery, including Distillery of Year - 2010 Malt Advocate. Reserve this elixir for your finest friends and occasions and serve in your finest crystal whiskey tumblers. My choice is Gleneagles St. Andrews crystal from the Scottish borders. The tumblers fit nicely in the hand and are smaller than average, giving the illusion of a generous pour while serving all that is necessary to have the true experience. We opened our bottle of Cask Strength the evening of the Grey Cup Western Final - for Roughrider fans, I need say no more! Celebrants left with a glow that far surpassed the mere joy of winning the Western Conference, with the designated driver cursing his luck. Finish - Astonishingly long and glorious finish with "peat clinging to every corner of your mouth"
Thank you for this bang-on description Jack! When it comes to vodka, Schramm is the number one choice for your best occasions. A sipping vodka, the robust flavour is unique in the vodka world, owing to master distiller Tyler Schramm's slow pot distilling techniques, local organic potatoes and pristine mountain water in the Pemberton Valley near Whistler BC. I first introduced readers to Schramm last February during the Winter Olympics when they were working with mixo-mistress Lauren Mote to create Olympian cocktails. 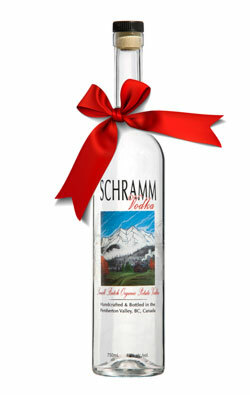 Not only did Canada bring home more Olympic golds than anyone dreamed of, but Schramm Vodka brought home the World Spirit of the Year and Double Gold Award 2010. A gorgeous gift for the spirited on your wish list. Delight your guests with Lorien Chilton's Christmas cocktail, Santa's Little Helper. BTW, Lorien and Tyler tied the knot in July so the sweetheart story continues. Here's another sweet and simple Schramm cocktail that will effortlessly impress. Shake well with ice and strain into a chilled martini glass. Garnish with candied ginger. Combine tea and water in a pot over medium low heat. Simmer for 15 minutes, stirring frequently. Cool and strain, reserving tea. Dissolve sugar and water over low heat. Add ginger and vanilla bean. Bring to a boil and remove from heat.Steep for 20 minutes. Cool and strain into a bottle and refrigerate for use (will last a few weeks). Shake well with ice and strain into a chilled martini glass. Garnish with lemon wedge and a swirl of honey. Flora de Cana rum is so lovely with hints of caramel and vanilla, no wonder it is the world's most awarded rum. As Central America's most popular rum, it is the only one produced in Nicaragua with the largest stock of aged rums worldwide. The rums are slow aged, with varying ages never mixed. The age on the bottle is the true age of what's inside. The Grand Reserve 7-year old Flora de Cana is the perfect choice for a holiday classic-rum punch! with all the right holiday flavours-nutmeg, cloves and apple. Dissolve the sugar cubes in 1 oz. of club soda (this generally involves muddling to help process). Muddle the cloves with the sugar cubes. After the sugar cubes and cloves are muddled/dissolved, add the rest of the ingredients one at a time and stir as added. Add ice once all of the ingredients have been added and stir the punch until it is chilled. 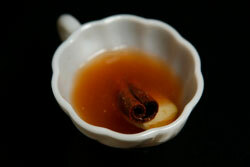 Strain the punch into a glass or punch bowl, depending on the size of the portion, top with 2 parts club soda and garnish with apple slices and cinnamon sticks. For the ladies in your coterie, and guys too, Xante should always be close at hand. When serving something this special, people feel special in return and will remember the occasion with a depth of spirit that lingers long after the evening winds down. This pear cognac liqueur is so unique, your guests will feel exulted and blessed by this beauteous balm and never want to leave. This may not be a good thing! Let them know that though you love them dearly, the party, like 2010, albeit grand, is over. Send out the evening and 2010 with style and sparkle. Toast the future with Alsace sparkling wines from the same region in France. Alsace wines average at a mere $15-20 per bottle. At less than half the price of the average champagne, Alsace is the buy of the century - low cost high quality. Serve Cremant d'Alsace in a flute for the 2011 salute or in this elegant Xante based cocktail. In a shaker over ice, add first three ingredients. Shake vigorously, then splash with Cremant d'Alsace. 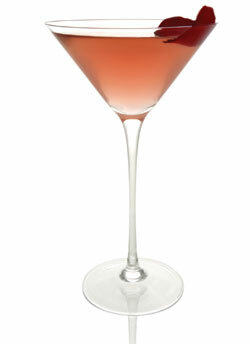 Strain into a chilled martini glass, garnishing with a red rose petal. Keep it simple, keep it tasteful and keep it fun. These libations reflect all that was best in 2010 - a year of excellence with more yet to come. Have a truly happy holiday - remember drink less, enjoy it more!